If shrimp are still frozen, place in colander under cold running water. Set aside to drain. Place squash and carrots in the bottom of a large saucepan or stockpot. Cover with water (see notes), place a lid on top and bring to a boil over high heat. Once boiling, reduce heat as needed and simmer vegetables for 5 minutes. Add shrimp, cover again, and continue to simmer 3-5 minutes or until veggies are completely tender and shrimp is opaque and cooked through. When vegetables and shrimp are done, turn off the burner. Transfer the creamy tahini soup base into a small mixing bowl. Ladle some of the cooking water from the soup into the mixing bowl and whisk or stir well to combine, adding more water until you have a thin consistency. Pour the soup base mixture back into the saucepan or stockpot with the water and vegetables. Stir gently to combine. Taste the broth and add salt & pepper if desired. Cover to keep warm. Transfer brown rice to a microwave-safe bowl and heat in 30-second intervals until hot. 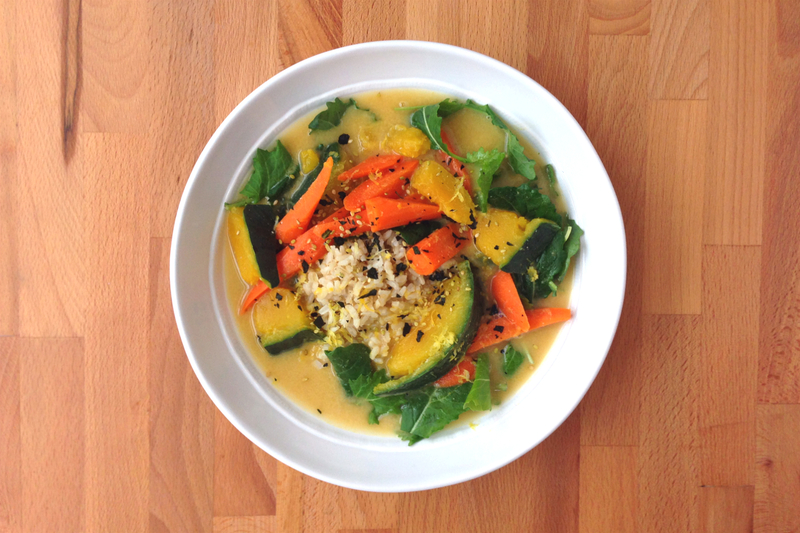 Divide brown rice and kale between serving bowls, then ladle the soup over the top. Finish each bowl with a little grated lime zest (see notes), a squeeze of lime, and a sprinkle of toasted sesame & kale crunch. To remove lime zest use a microplane, or the small side of a grater to remove just the bright green part of the peel. This entry was posted in Meal-Kit Recipes, Seafood, Seasonal, Winter on February 14, 2016 by Megan Rappe.